Sweetly B Squared: Circus Time! I started reading a book about the history of the circus (The Ordinary Acrobat by Duncan Wall) a few months ago. It was great, but I was too easily distracted. And I think it was a new book with a shorter circulation time (excuses, I know). 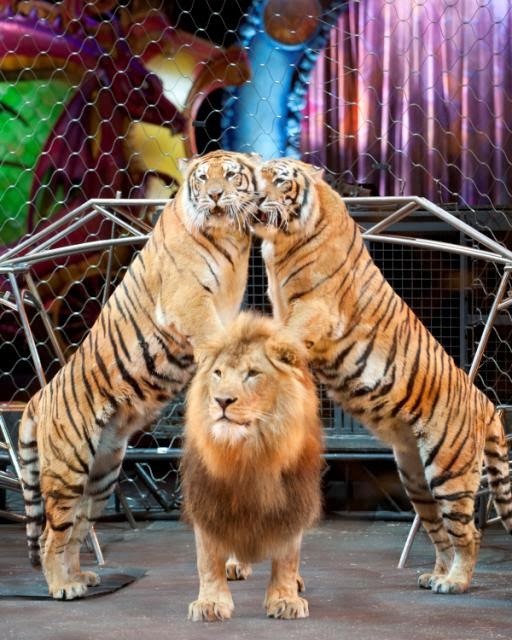 The average distance the Ringling Bros. circus train travels between cities is 350 miles. Each year, an average of 1,000 hours is spent traveling by train from city to city. 109,500 meals per year are prepared at the Pie Car, the Ringling Bros. traveling diner. The DRAGONS' train will travel an average of 16,000 miles this year alone! If I were going to join the circus, I discovered I would be 'particularly predisposed to being an attentive and artistic animal trainer!' What would the best job for you be with the circus? Find out here with Ringling's Aptitude Test. Not ready to join the circus just yet? Come out and watch it for a super fun evening! If you're near the metro Detroit area, Ringling Bros and Barnum & Bailey are presenting DRAGONS at the Palace of Auburn Hills, November 13 - 17, 2013. You can use promo code 18MOM for $18 flat rate tickets (Good on all performances. Not Valid on FR, CC or VIP seats and must be purchased in groups of 4). Visit Ticketmaster to order your tickets now!